Join us for the opening of the Winter 2019 show of the East Coast Art Collective, Collectively Chromatic, opening January 17, 2019 at the Cultural Arts Center at Glen Allen. Collectively Chromatic is a group show including work by 14 members of the East Coast Art Collective (ECAC), a group of artists primarily based in DC but also located throughout the east coast. 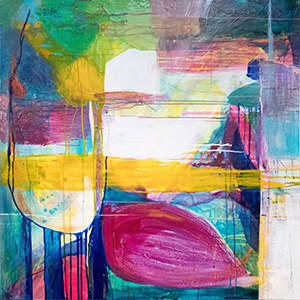 The ECAC, curated by Ann Marie Coolick, includes artists whose main foci are color and the unique applications of texture. Many of the ECAC artists have had studios in close proximity to one another, no doubt influencing one another's practices.